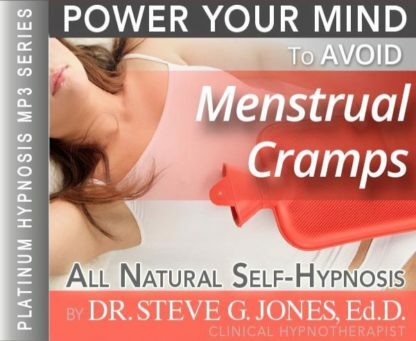 This NEW powerful Improve Menstrual Cramps Hypnosis MP3 will give you the confidence you need to finally overcome Period Pain / Period Cramps!!! Steve G. Jones, Ed.D., Clinical Hypnotherapist, charges $1,500 for a custom recording and $25,000 for a one-hour private hypnotherapy session at his office. But you can get all the benefits for this low price. Simply listen to the Improve Menstrual Cramps Hypnosis MP3 download every night as you go to bed for three weeks and feel the changes happening in your life. You will feel more empowered, more in touch with your true self, and you will truly know that your goals are within your reach. Steve G. Jones achieves AMAZING and LASTING results!!! Hypnosis is the easiest way to affect change in your life because the positive messages go straight to your subconscious mind effortlessly so you can accomplish your goals and reach for the stars!! 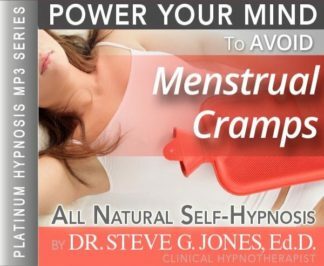 All you have to do is listen to the Improve Menstrual Cramps Hypnosis MP3 audio at night as you go to sleep!!! You’ll hear soft music, the gentle sounds of the beach, and the soothing sound of Steve G. Jones’ voice all working together to bring about positive changes in your life easily and naturally. Steve G. Jones has been helping people improve their lives with hypnosis for over 17 years…now it’s time for him to help YOU… don’t wait, do it NOW !!! you’ll be glad you did. See you at the top! If you are plagued by cramps during your time of the month, then there is no better and more natural way to ease the cramps than hypnosis. Hypnosis has been researched in countless studies involving pain. Hypnotherapy is a safe and effective way to put an end to the pain you feel during your menstrual cycle. The Improve Menstrual Cramps Hypnosis MP3 recording allows you to be in control of your cramps. The hypnosis session will give your subconscious mind the power to lessen the pain from the cramps. This hypnotherapy program will give you positive and powerful suggestions that enable you to control your cramps. Each time you listen to this recording, you will get better at controlling your cramps. Realize that you can be in control. You do not have to deal with painful cramps anymore. You can depend on hypnosis to ease your pain so that you can have an easy and cramp-free menstrual cycle. We suggest that you listen to this self-hypnosis session every night before going to bed for 21 nights in a row. Your mind will be taught to control your pain from the cramps as if it is a dial. You will learn that by turning this dial, you can turn down the pain. This is a very powerful hypnosis program that will help you! Don’t suffer any longer – stop the period pain and start enjoying an easy cramp free menstrual cycle with Hypnotherapy!! !